Charge and The Energy Body with Anodea Judith, Ph.D.
10-04-18 Charge and The Energy Body with Anodea Judith, Ph.D.
We all know what it’s like to have a “charge” about something. It could be excitement, fear, sexual arousal, or even irritation. But what most of us don’t know is how to use our emotional charge to enhance our vitality, become more effective, and open to spiritual experiences. Charge is a word for the basic life force running through us. Mastering this energy is crucial if we are to meet the challenges of difficult situations, heal past wounds and traumas, and manage the stress of modern life. Even more, it is essential for understanding how to manage your own life force and become all you can be. 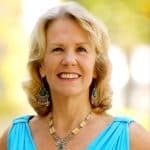 Dr. Judith makes an important contribution to the growing field of Energy Medicine by looking at charge as the missing ingredient in mind-body healing by bringing us into a deep intimacy with our own life force, as well as an understanding of how charge runs our personal and professional relationships. Tune-in to find out how to stop being “overcharged” or “undercharged” and how to bring about balance through practices of charging and discharging. We will also discuss how to expand your comfort zone to experience new states of aliveness. Bio: Anodea Judith, Ph.D. has been called “a prophet for our time.” A groundbreaking thought leader who is the founder and director of Sacred Centers, and a writer, therapist, and spiritual teacher. Her passion for the realization of human potential matches her concern for humanity’s impending crises—her fervent wish is that we “wake up in time.” She holds Masters and Doctoral degrees in Psychology and Human Health, is a 500 hour registered yoga teacher (E-RYT), with lifelong studies of psychology, mythology, sociology, history, systems theory, and mystic spirituality. She is considered one of the country’s foremost experts on the combination of chakras and therapeutic issues and on the interpretation of the Chakra System for the Western lifestyle. She teaches across the U.S., as well as in Canada, Europe, Ireland, Asia, and South and Central America. She is best known for the chakra classic, Wheels of Life: A User’s Guide to the Chakra System, (Llewellyn, 1987, revised 1999), considered the definitive work on the subject, with over 200,000 copies sold in English and additional printings in 25 languages. A second book, co-authored with Selene Vega: The Sevenfold Journey: Reclaiming Mind, Body, and Spirit through the Chakras (Crossing Press, 1993) arose out of the popular Psychology of the Chakras Intensive, taught by Judith and Vega for nearly three decades. Eastern Body, Western Mind: Psychology and the Chakra System as a Path to the Self, Celestial Arts, February 1997, revised 2004) charts childhood development, bioenergetic character structures and Jungian individuation, all within the chakra model. This book is used as a text in universities and healing schools across the country. In March of 2000, she released a six-tape audio course called: The Chakra System: A Complete Course in Self-Diagnosis and Healing followed by the popular boxed multi-media kit: Chakra Balancing, both through Sounds True. Her artistic expression combines with her mystic passion in her award winning DVD, The Illuminated Chakras, a co-creation with her son, artist and animator, Alex Wayne. The Illuminated Chakras, won the best-animation award at the New York Film Festival in 2004. The Global Heart Awakens, (The Shift Network, July 2013) is a rewrite of the 2007 edition, Waking the Global Heart, which won two literary awards, including a Nautilus Gold. This book charts the history of human development into our present crisis and necessary transformation, with an inspiring message of hope for our future. Released in 2012 and coauthored with Lion Goodman, is Creating on Purpose: The Spiritual Technology of Manifesting Through the Chakras (Sounds True, 2012) teaches people how to bring heaven down to earth through the manifestation process of making change in our lives and our world. The much-anticipated release of Anodea Judith’s Chakra Yoga (Llewellyn, September 2015) replaces her ever-popular and useful Chakra Yoga Teacher Training Manual.